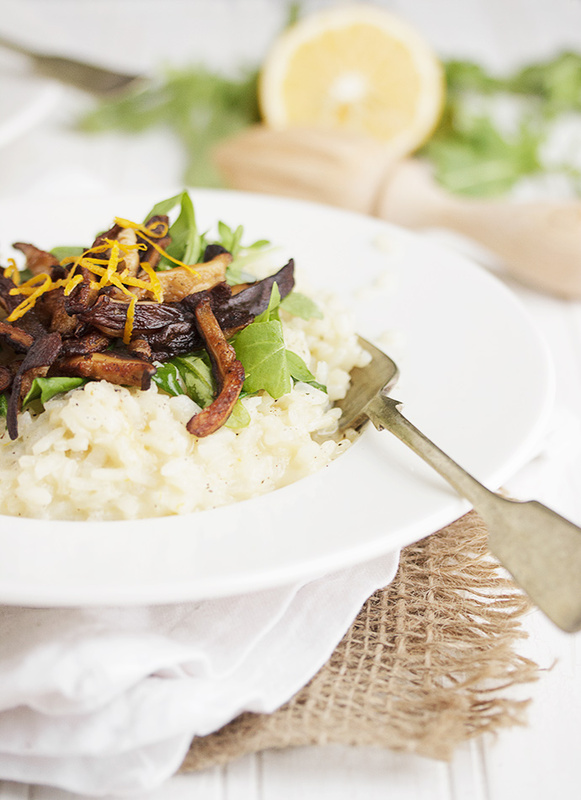 A perfect meatless main dish, this Meyer Lemon Risotto with Shiitake Mushrooms is also a delicious side dish for grilled chicken, shrimp or fish. 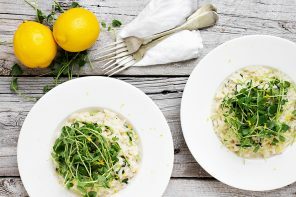 Risotto is one of my favourite ways to enjoy a meatless meal and lemon risotto is one of my favourites. 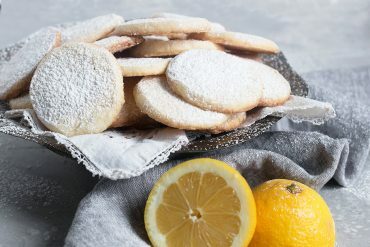 With Meyer lemons currently in season, they were my choice this time around. 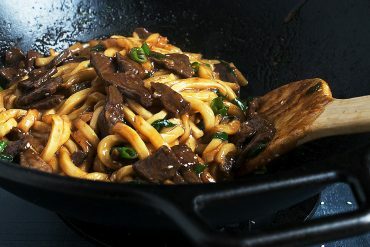 To make it a little “meatier”, I added a some pan-fried shiitake mushrooms and for a little green, some wilted arugula. While risotto does require some attention, it really doesn’t require constant attention. Regular stirring is sufficient. No need for constant stirring. Be sure to taste at the end and add salt, pepper and maybe a touch more lemon juice, if needed. You can certainly make this risotto with regular lemons, as well, if you can’t find Meyer lemons. Spinach could also be substituted for the arugula. 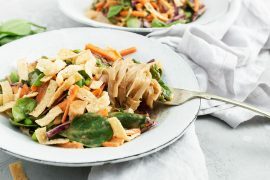 Make this dish gluten free by using gluten free chicken broth or vegetarian by using vegetable broth instead of chicken. This risotto recipe will serve 2 as a meatless main dish, or 4 or a side dish. It’s perfect as a side for grilled chicken, shrimp or fish. A great meatless main dish or a perfect side dish for grilled chicken, shrimp or fish. 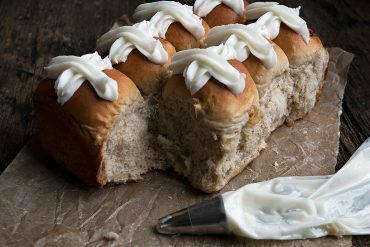 You can make this with regular lemons, as well. This recipe will serve 2 as a main or 4 as a side dish. In a medium saucepan, heat broth over medium heat until steaming. In a large frying pan, over medium heat, melt 3 Tbsp. butter. Add shallot and cook, stirring, until softened. Add rice and stir, until coated in butter, about 45 seconds. Add the wine and cook, stirring, until the alcohol smell burns off, about 1 minutes. Add one ladle-full of the warm chicken broth and cook, stirring regularly, until the broth disappears. Add another ladle-full and continue cooking, adding ladles of broth as it disappears, until all the broth is gone. Meanwhile, in another frying pan over medium heat, melt 1 Tbsp. butter. Add 1 Tbsp. olive oil, then add the mushrooms. Cook, stirring regularly, until golden brown. Keep warm over low heat. When the risotto is almost cooked (when adding the last ladle-full of broth) add the lemon zest, lemon juice and Parmesan. Stir to combine. Add the arugula and cook, stirring, until wilted. Taste risotto and add salt and freshly ground pepper, as needed. Spoon risotto onto plates or shallow bowls. Top with warm shiitakes and a bit of lemon zest. Such a gorgeous risotto… and I love the idea of adding lemon! I haven’t taken the plunge into making it myself yet, but I’ll definitely have to at some point since it’s a big favorite of mine and always something I’m excited to see on a menu! Looks amazing Jennifer! (just like all your recipes!). Love the Shiitake/lemon combination! While living in Italy I had the honor of being tought quite some kitchen secrets by authentic “mamas” y “nonnas” (grandmas). When it came to risotto, they all had one strict rule: “do not touch the spoon!” No stirring! Only swooshing the pan around by its handles (only once in a while). In case it sticks, let it stick! Prepare to scrub afterwards! I live in Spain now and paella is made using the same rule. Thanks Vanessa and thanks for sharing the mamas y nonnas risotto secret! I’ve found over the years I stir less and less, but honestly, I was just being lazy ;) I’m definitely going to try the no stir method next time I make risotto. I have never made paella, but it’s on my bucket list. Have a great “starter” paella recipe to share? I’m so happy Meyer lemons are back! They are my favorite! This risotto looks delicious! Thanks Liz. I look forward to them every year! 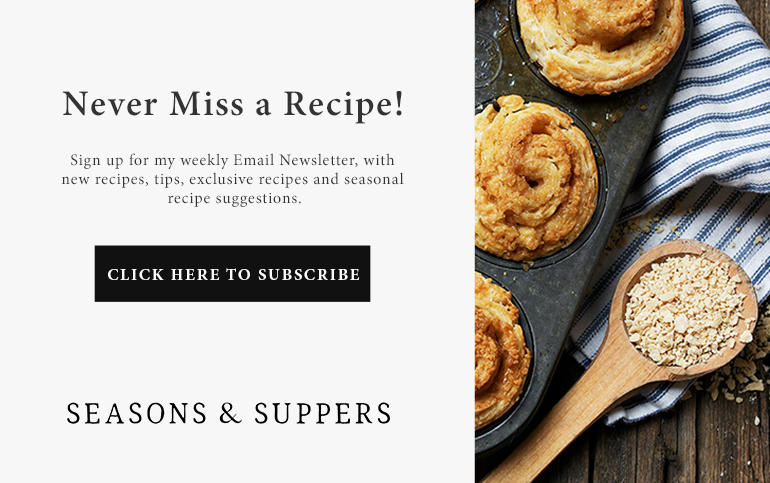 This risotto is gorgeous Jennifer – I am especially love your photos too! It looks so creamy and I love the addition of the mushrooms, I could ALMOST forgo meat and eat only mushrooms… almost. 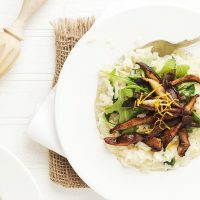 Mushroom risotto is a favorite of mine and you are so smart to add Meyer lemon – I must try this! Thanks Laura. The Meyer lemon was really nice in this one! 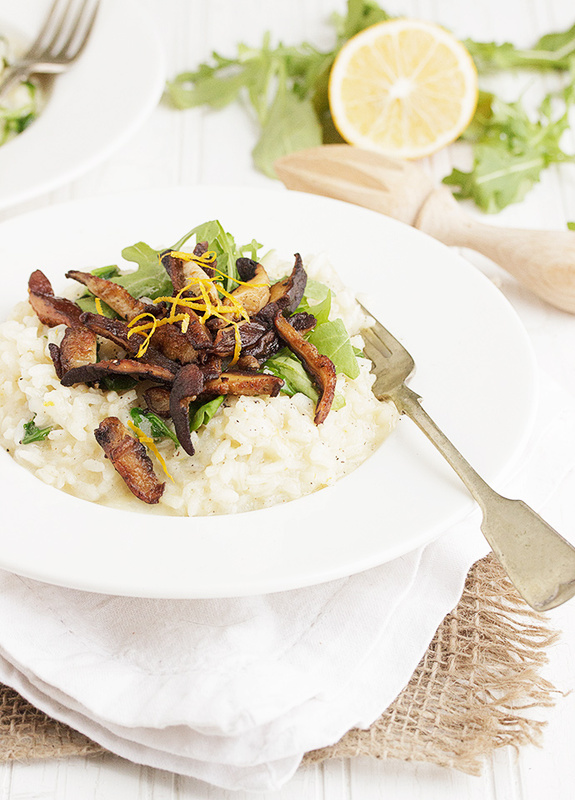 I love lemon and mushroom risotto but never have I used shiitake mushrooms before. 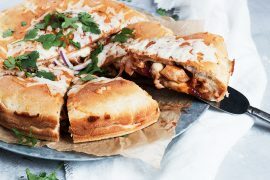 This is a must try recipe for me, not only does it look delicious but it is so beautiful! Thanks Thalia. I love shiitakes. They are very earthy and firm, so make a great substitute for meat in any dish. 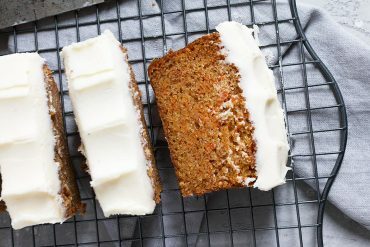 Meyer lemons and shitake mushrooms, two of nature’s most perfect foods — this looks amazing! I have been searching for a fun veggie main this morning and this is it! I LOVE making risotto so this hits all the right notes with me. I can’t wait to try it! I too am a huge risotto fan. 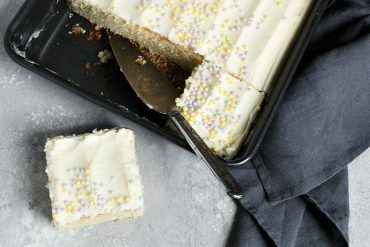 I love making (baking) it for a crowd. Always gets ooohs and ahhs. I really like this combo- the earthy shiitake and the peppery arugula with lemon. Awesome. Thanks! Thanks Gail. It was a great combination of flavours! 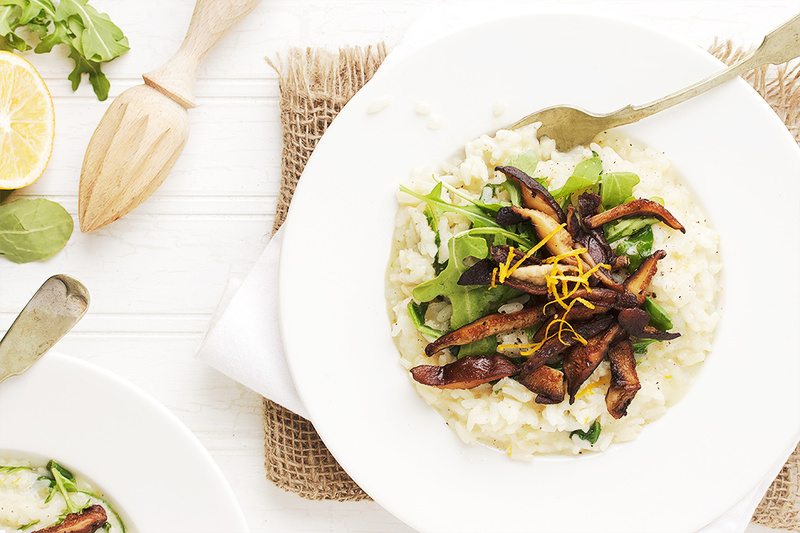 Totally with you – risotto is a fabulous way to enjoy a meatless meal! And this risotto looks lovely. Those shiitakes look perfect. Risotto defines comfort food for me and I completely agree on the meatless meal. Risottos and pastas are so effortlessly meatless! This one is absolutely beautiful, Jennifer. I wish I could get my hands on some Meyer lemons….they are still quite rare in my part of the world. Thanks Julia. Meyer lemons just started showing up in stores around here last winter, but this risotto would be equally lovely with regular lemons. Oh, risotto is one of my favorite dishes! The boyfriend just bought a ton of Arborio rice for that very purpose. Pinning this one for later this week!